Full Speed Ahead at the Delta Phi Epsilon Project | Dublin Construction Co., Inc.
1st and 2nd floor wall framing is nearing completion at the Delta Phi Epsilon project. The wood framing is currently scheduled to be completed by the first week of May. Our team is on schedule to deliver this project in time for Fall 2016 sorority recruitment! 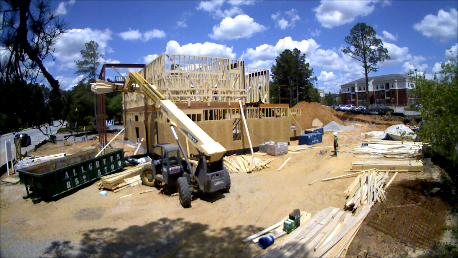 Below is a time lapse video of the framing through April 25th.